Serie de TV (2009-Actualidad). Nuestro héroe, Gingka y sus leales amigos se topan con una peligrosa organización llamada “Los Nébulas Oscuras”. La única misión de este grupo es conquistar el mundo y dar rienda suelta a su maldad. Pero antes de poder hacerlo deben destruir a Gingka, la única persona con la fuerza suficiente para interponerse en su camino. Si estás en Roma, ¡Juega beyblade! Building the Perfect Bit Beast! When in Rome... Let It Rip! Let The Games Begin... Again! Boris, the Blade Stops Here! Libra Departs for the Front! The New Striker is Complete! The God of Destruction, Resurrected!? Kerbeus: Guard Dog of the Underworld! 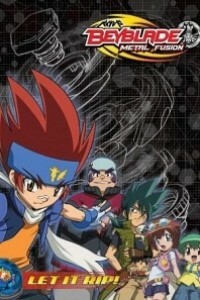 Beyblade Club: Let's Get Started! Into the Darkness! Dark Doomscizor! The Flash Launch! It's Crazy Fast! A Powerful Opponent! Hyper Horusood! Get Over It! Trust in Valtryek! A Fierce Battle! Valtryek Versus Spryzen! A Group Lesson! Shakadera Special! Team Battle! It's Off the Hook! Bring It Together! Chain Launch! Let's Do This Thing! On to Nationals! Training Camp! The Biting Stadium! Mountains! Rivers! A Huge Stormy Adventure! The Beasts Bare Their Fangs! Jumbo Jormuntor! The Venomous Snake! Roar! Battle of the Beasts! Battle for the Top! Valt vs Xander! Old Rivals! Lui Versus Shu! To the World! Valkyrie's Evolution!! Reach It! The Top Team!! It Begins! The Europe League!! The Collapse of BC Sol!! The Bird God Blader, Ghasem!! Blast Jinnius Calling a Storm! Tokyo Battle! Real VS Rios!! Collapse! The Big 5's Wall!! The Finals! BC Sol VS New York Bulls! Let's Go! The God Bladers Cup!! A Deadly Weapon! Spriggan Requiem!! The Underground Battle Emperor, Kurtz! Super Evolution! Strike God Valkyrie!! Beyond the Limit! Free VS Lui!! The Decisive Battle of Friendship!! Flame God! Super Z Spriggan!! Super Z Clash! Showdown in the Demon Castle!! Explosive Birth! Super Z Achilles!! Aiga's Revenge From the Soul!! Knight of the Wind, Air Knight! Battle Royal! A Strategy for a Great Battle!! God of Destruction! Dead Phoenix!! Super Z Special Training: Kingdom Chapter!! Super Z Special Training: Savanna Chapter!! The God of Flames vs The God of Destruction! !